While Cameron’s dive only offered views of a few hundred square meters of the ocean bottom, it was truly another great symbolic leap for mankind. If the space program had received financial support at the low levels of ocean programs, we’d never have reached the moon, we wouldn’t have a space station, and there would not have been a space shuttle program period. Cameron’s achievement, more than anything, points out the lack of interest in the ocean and in ocean funding by policy makers. Ninety-five percent of the ocean is unknown or unexplored. Only five percent of the ocean floor has been charted and most ocean bathymetry is based on satellite observations of the sea’s surface, resulting in a margin of error of 600 meters. As big as the ocean looks to humans, if the earth was the size of an apple, the ocean would only be as deep as the skin. More so, the Earth is vulnerable to the activities of seven billion humans. The ocean contributes $223 billion to the nation’s gross domestic product and is a huge part of national economies around the world. So what is at risk if we as people, don’t better grasp a better understanding of the ocean? The inability to adequately predict changes in weather patterns and extreme events and prepare for the potential of sea level rise, shifts in agricultural productivity, and the dislocation of millions of people. Unrecoverable impacts to the marine ecosystem and the loss of a source of protein for the more than one billion people who depend on fish for that protein. Loss of present and future economic benefits. The ocean supports nearly 1.5 million establishments, employing 2.6 million people. According to Wikipedia, 529 people qualify as having reached space, and space travelers have spent over 30,400 man-days (83 man-years) in space, including over 100 astronaut days of spacewalks. 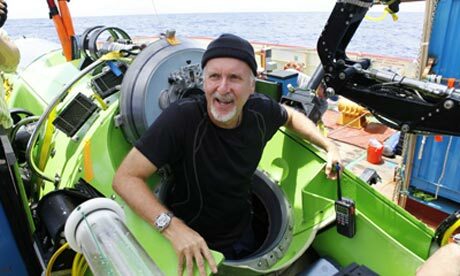 James Cameron’s milestone can be likened to astronauts landing on the moon, yet it only happened because of the resources of this wealthy man. No governmental initiative thought it important enough to pursue. What does that say for the status of our understanding of the ocean? This article first appeared in the May/June 2012 issue of Air2Air Magazine. Previous PostA View from Rio+20Next PostCan Hope Replace Fear in Managing the Ocean?